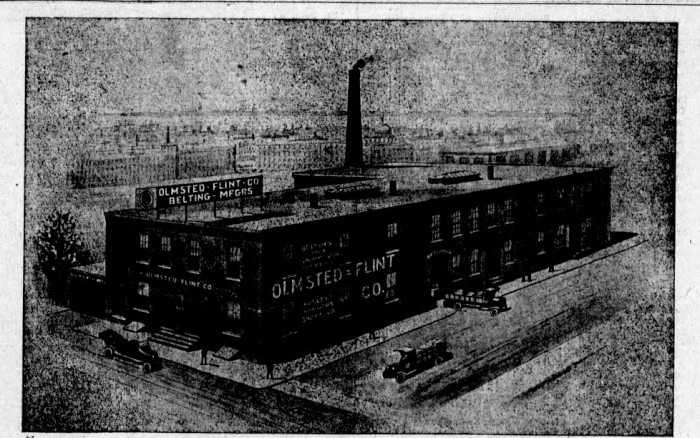 The Olmsted-Flint Company was founded in 1910 in New York City by Willard I. Olmsted, Stanley B. Flint, George S. Baker and Frank M. Schiffmacher. They began manufacturing leather belting in a factory at 33-35-37 Sullivan Street with an office at 136 Liberty Street. Within a few years, they moved manufacturing to Lawrence, Massachusetts. A year later, the partners were bought out by Frank Schiffmacher and on January 1, 1915 the business was moved to Cambridge. The move to Cambridge was motivated by the fact that a large percentage of the company's business was serving New England factories. A century ago, leather belting was widely used in factories to distribute rotary power. The building at 624 Main Street was originally L-shaped, but at some point was truncated to a simple rectangle. The company continued with their main business of manufacturing leather belts under the trade names of "Pacemaker" and "Oilskin". They also branched out into stocking other power transmission components from such brands as Universal Giant, Rockwood, American Steel and SKF. 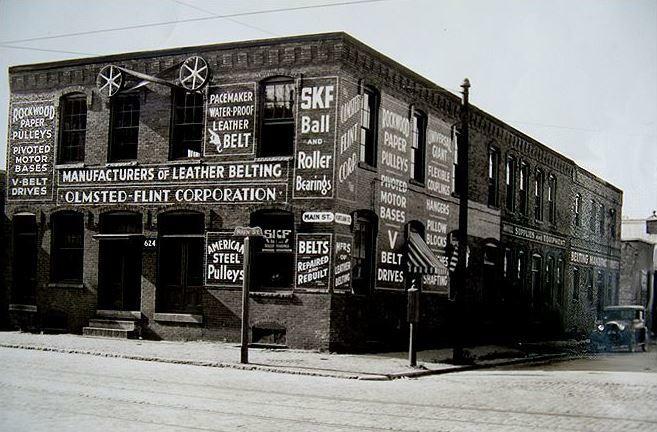 The trademark of the company was one of their waterproof leather belts running in a figure eight on the front of the building. The belt was adorned with the name of the company and advertising. In later years, this display was lowered to directly above the entrance. The building directly to the east, 600 Main Street, was occupied by Polaroid. Further west, 700 Main Street, was also Polaroid's. The new building, directly to the west, is strangely numbered 610 Main Street. Olmsted-Flint continues to operate to this day in West Springfield, Massachusetts, with an office in Woburn. Information from The Cambridge Chronicle, 1923/9/29, 1923/10/20, 1923/10/27, Mill Supplies, 1915, Volume 5, The Iron Age, 1915, Volume 95.